We’ve been talking about the Catlins now for many years. It’s become that mythical place down south, that others have visited. They have regaled us with their journeys, marvelled, and mentioned the rogue waves at Cathedral Caves. How the water rose suddenly, possibly waist height or perhaps they or I have exaggerated this. But still, the Catlins sounded wild, other, and we kept promising ourselves to go there. Back in 2005, we got close. We flew to Invercargill and grouped at Tuatapere to set off on the Humpridge Track. A luxury walk, with a helicopter carrying our luggage aloft, dangling from the craft in a large net-like basket. A celebrity accompanied each group and our celebrity was so low level that none of us had heard of him before, and I still can’t recall his name. … we finally flew south to Dunedin enroute to the Catlins. I caught up with an old school friend whom I hadn’t seen since Form II (the sixties and now we are both in our sixties). John indulged this re-connection made possible through Facebook initially. My friend has become a talented artist and somewhat of a recluse. Dunedin was cold and chilly but the railway station was a revelation. Such splendour and beauty and we’ve promised ourselves to return and take the Taieri Gorge train trip someday. We set off in our sweetly named Tivoli hire car. John who’s had a love affair with cars over many years, conceded that this compact, toy-like vehicle was actually a great machine with all the digital accoutrements that our cliched Subaru Outback lacks. We listened to podcasts as we headed to the Coast. At first, approaching Nugget Point, I was underwhelmed, comparing it to Kaikoura and Cape Foulwind, claiming they were more spectacular… but then we climbed up to the Lighthouse and looked out at the expanse of sea and coastline in all its glory. I scanned the water prayerfully, hoping to see a whale, held my breath, wishing it into existence. No whales, but the water mesmerised. I have this weird issue that I suffer silently whenever I’m on high cliffs or looking into any kind of chasm or abyss… my brain tells me to jump and it’s not a death wish, it’s a weird and strange thing I’ve endured all my life. I know that I won’t jump but still this little battle ensues in my head and sometimes I have to just step back, close my eyes and gather my breath, alter my thought patterns. John oblivious with his camera is always teetering at the edge, taking risks to capture the best photo, so I’ve learned to stop watching him. We stayed at Owaka the first night and what hospitality. Our motel was mainstream budget with a room next to the laundry so we could hear the hum and throb of the other occupants washing. We had a goat tethered outside our front sliding glass door, eating the shrubs and sheep grazing out another window. We walked that night to the Lumberjack café. There was a warm fire to greet us, friendly staff and one of the nicest meals ever – John had steak and I had a lamb rump – maybe it was the proximity to the grown food, or just the expertise of the chef, but the food was mouth-wateringly good. We walked home to the smell of coal fires and a clear sky, reminding me of my 50’s childhood. Under the canopy of the Milky Way we watched for falling stars and texted a friend in Niue to find to our surprise that it was the day before over there. I took a quick snap of the teapot museum as we were leaving Owaka and we hit the trail for Cathedral Caves. Ever the dramatist I had concerns about us being trapped by the tide. Instead we had the most beautiful sunlit morning and easy access both in and out of the caves. A small posse of tourists got caught just after we left, as a rogue wave stranded them on rocks, but they loved that. The great beauty of these caves is their natural un-enhanced beauty, unlike the neon-lit caves we visited at Halong Bay a few years ago in Vietnam. Then it was onwards to Curio Bay. I have memories from a marching trip in the sixties, being on the train, heading to Invercargill and we looked out the window at what we were told was the ‘Petrified Forest’, so I had images of upright trees, etched into my brain, ghostly, devoid of foliage, but standing. Everyone I tell this story to shakes their head in disbelief and tells me I got it wrong. And they are right. The Petrified Forest at Curio Bay is our very own Jurassic Park but very different from this memory etched image in my brain and indeed, the train did not run anywhere near this piece of Coast (or so they tell me). The forest was washed by the tide over 180 million years ago. It’s impossible to take in or truly imagine. John was once again lost in his photo lens stooping to capture the petrified markings on the trees. I think of Ancient Messini in Kalamata and how we marvelled at the uncoverings, but these petrified trees are unimaginably older. I still can’t believe that tourists have free access to wander at will, and too, there are the nesting yellow-eyed penguins (we didn’t see any wildlife, and we’ve been told that late April is too late in the season). So, we may need to return. After Curio Bay, we at lunch at Niagara Falls Café, housed in an old school building in a charming bucolic setting. The café is run by a family whose daughter is a medal winning Para Olympian and her medals are there on show, casually amid the food cabinets and bric-a-brac – no high security required for such precious memorabilia. We spend the night in an overly spacious (expensive, but all that was available), four bedroomed house right on the peaceful harbour at a place called Waikava Harbour View, and yet the settlement is called Wakawa, the discrepancy we couldn’t quite fathom. The promised Wi-Fi didn’t eventuate and here are two brilliant comments from guests which caught my fancy! You gotta love the Visitors’ book. Like naughty school children we scuttled to the car and fell about laughing in the car at having been scolded so old-school style. Where we live, in the bush, by the sea, autumn for me is the best time of year. We moved to our house on the hill in autumn twenty something years ago, and it was the still air, the mellow sunshine, and the leaves dropping in the garden, that captured our hearts. The harbour is quieter this time of year, calling us to kayak. The cicadas have ceased their courtships and the wasps are out, lured by the Easter spices. I’m affected by the light, the warmth, the sense of peace that only autumn seems to bring. And then, it is Anzac Day and the brass band, the bagpipes and the haunting bugle, bring another layer of nostalgia peculiar to my Kiwi childhood, that lovely in-between season thing where summer has ended, but winter hasn’t yet begun. I ran behind my granddaughter today on our nature walk, she was wearing a hand-knitted cardigan in strawberry, aqua and bluish hues. I watched her back running through the bush collecting special sticks so we could block the creek further up the hill. When she snuggled for a cuddle I could smell shampoo and wool and the damp soft mud beneath our feet. I bought her a poppy to wear on Wednesday and she loves red. We looked for the toadstools we’d seen the week before, and mourned their loss, wondering what had happened to them. I was reminded of this beautiful poem by Gerard Manley Hopkins that I only encountered late in life studying English Literature at Victoria University when I was 50, and indeed, I used a line or two of this poem in my first novel ‘About turns’. And yet you will weep know why. My granddaughter and I will meet outside the local school on Anzac morning. Then we will march alongside the war veterans (there cannot be many left, but perhaps from the Vietnam War), and I will be stirred by the music on two counts. One because I was a marching girl in the 50’s and 60’s and two because I’ve always followed the Anzac Parade, to see my Dad in his shiny and freshly polished shoes, wearing his war medals that Mum would stitch temporarily on to his suit, so they hung straight. Now I have his medals and his Crete badge and his small barbed wire pin, remnants of his war efforts. Perhaps this year I will wear them. When he was alive, and after I was married with a family, he would sometimes come and stay with us and we would do the Dawn Parade in Wellington and then our own local parade. We couldn’t get enough of it. Nowadays, I just do the local parade and adjourn to the RSA for the home-made pikelets, sausage rolls and cups of tea, followed by an obligatory beer with my friends and we toast my Dad. This will be my first Anzac Parade with my granddaughter. In 2002, I travelled with my husband to Greece and to Crete to retrace my father’s war journey and to Poland where he spent four years as a prisoner of war. I wrote about it and the story was published in the New Zealand Listener. Regrettably, I inadvertently wrote of Stalag VIIB instead of Stalag VIIIB, and neither the Listener nor I picked it up before it went to print. What prompted this post about Anzac Day is one of my favourite blogs Surprised by Time.and on reading this blog I found more information about where my Dad might have been on mainland Greece, before arriving at Suda Bay for the Battle of Crete. This is part one of a two-part blog that includes excerpts from New Zealand and Australian veterans of the Greek campaign, both on mainland Greece and Crete. It is well worth reading. A couple of years ago, a friend of mine, Mary McCallum decided she would begin hosting poems on her blog. It sounded like such a fun thing, and as it was around Easter, I suggested that I had a poem she might like. Well, Mary is a very talented poet and a perfectionist. I sent her my run-on Easter poem and we chatted via email over the weekend before it was ‘published’. There were queries about words and line breaks and eventually, my run-on poem became the shape of an Easter cross. Yes, I can’t take the credit for this, was the clever eye and editing of Mary. I like the cross, and too, I liked the run-on of the poem when it wasn’t a cross. It’s interesting how a poem can change shape and yet the meaning more or less remains. I’m not big on overt symbolism so I worried that my poem wasn’t strong enough to carry the Easter Cross. I am going to re-post the poem here on my blog, without the shaping, first because it’s tricky on a blog to get the poem to stay in shape, so hat’s off to Mary, but also because I thought the poem might work in its more or less original form, as a kind of run-on. floats in the dark pool of wine. hot mugs of wine in relief, glad. Although, I’m not religious, I love Good Friday and the poem is about the way we celebrate our Good Friday. 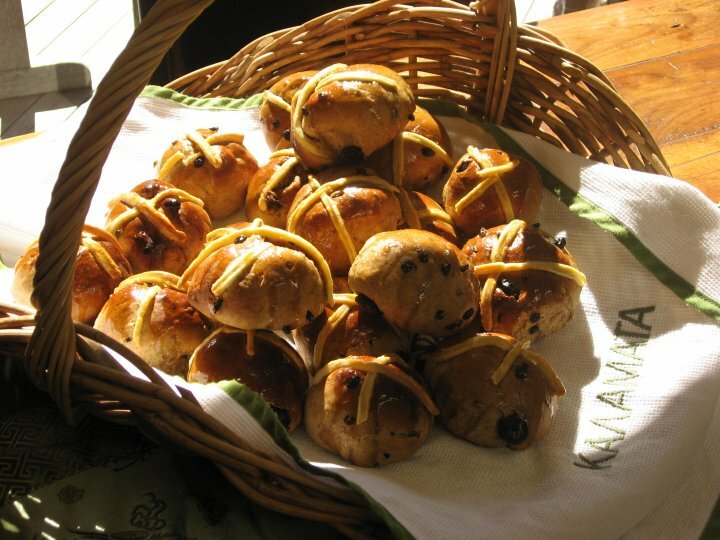 We have friends over to eat my home-made hot cross buns and drink our (top-secret) staggeringly alcoholic mulled wine. It includes aquavit or schnapps, Muscat de Frontignac (when we’re feeling flush), vermouth and red wine, not to mention cinnamon sticks, orange peel, cardamoms, seedless raisins and almonds. The red wine is usually run of the mill, or even cask red, as once you’ve added sugar and almost boiled the stuff…. well… but one year, my daughter-in-law’s sister had just celebrated her summer wedding and there were a spare few bottles of rather nice red left over which were generously donated to the mulled wine. Many of us, sipping that particular brew, rued the fact, we’d cooked it! The buns have crosses, but my family get their own bun decorated with their initial instead of a cross, and now I have a granddaughter who has the same initial as her father – they are both the ‘S’ bun. My youngest son is a ‘T’ bun, which is more or less, a cross I guess, but as he lives overseas, there won’t be a‘t’ this year. When I say I’m not religious, this does rather omit my Catholic (leaning toward Irish) upbringing. So, I have fond memories of Good Friday, the three-hour pageantry, the stations of the cross, the kneeling the standing, the drama. We had handsome Irish priests to lust after, and one passionate local priest, Father Bradford who would hurl himself at the floor in true grief at almost every station, building to a heart-rending finale. I was glad when Simon came along to help carry the cross, I loved it when Veronica wiped the face of Jesus, and we all fell in unison, once, twice three times, when Jesus fell, down on our knees, urged on by the theatrics of Father Bradford. But, I must confess, I was sometimes distracted by the gorgeous outfits of the girls from Waimea West by the time they laid him in the tomb. You see, Easter was a time of religious fervor and fashion. It was the between seasons moment when you could wear your new winter outfit, and admire everyone else, including their hats. We were a small parish and at Easter for some reason, we would collect the surrounding countryside parishes into our church – oh, a host of fabulous fashion, girls my age whom I saw perhaps once or twice a year, and we’d all be wearing our very best brand new Easter outfits. Yes, I loved the Stations of the Cross, Father Bradford leading us in what was I suppose, our own modest Oberammergau – we were part of the passion play, standing, kneeling, in thrall to his grief, perhaps exploring our own, and peeking, as you do, to see what the girls from Waimea West were wearing. A curious thing; my links are not working unfortunately, on either this or my last few posts. I have sent a message to WordPress and hopefully I will find a solution. So, in the meantime, if you wish to see the poem as an Easter Cross as first published, try this http://mary-mccallum.blogspot.co.nz/2010/03/tuesday-poem-mulling-it-over.html.